This viewer greeted news of NBCs decision to bring Dr. Hannibal Lecter to television with equal parts scorn and skepticism. The notorious serial killer on network television? And, with Manhunter, The Silence of the Lambs, Hannibal, Red Dragon, and Hannibal Rising, wasnt it time to retire the character for at least a couple decades? Even accounting for a shift from feature films to episodic television, it seemed like an example of going to the well once too often. Not to mention NBC is not exactly thriving when it comes to quality television. Having seen the first five episodes of the series, which begins airing the first seasons 13 episodes on Thursday, April 4th, the scorn and skepticism have almost entirely dissipated. The stab at classy horror mostly succeeds due to excellent performances from the leads, genuine suspense and surprises, well-constructed short and long-term mysteries, and an appropriately disconcerting mood that permeates the action right from the start. Like Foxs The Following, it is also shockingly gory at times. Horror fans should be pleased. The series commences right in the middle of a crime scene investigation, quickly demonstrating the unorthodox methods of Will Graham (Hugh Dancy). Some nifty (and thus far not overused) visual tricks are utilized to show how Graham analyzes a crime scene. He literally becomes the killer and does exactly what they do, be it stabbing or strangling. Time slows down and we see the dead bodies return to life as Graham plays the part of the killer. The pilot also provides an explanation for Grahams odd behavior and tactics. Explaining the way he is for the audience as much as the character hes talking to, Graham describes himself as being borderline autistic with a touch of Aspergers while also being an anti-social narcissist. He does not like looking people in the eyes and finds talking to others extraordinarily painful. Also, this Graham has no family, preferring dogs to humans and sharing his home with a large number of canines. Early episodes feature both a familiar killer-of-the-week format along with mysteries that are not wrapped up in a single episode. The first two have Graham, at the behest of Jack Crawford (Laurence Fishburne), investigating serial killers. While plenty gruesome, the killer-of-the-week stuff is the weakest part of Hannibal. There is too much that is implausible (Graham, really a consultant and not an FBI agent at this point, goes to a suspects home with a civilian and no backup) and generic (two weeks in a row Graham turns into a standard action hero and guns down bad guys to save the day at the last minute). Much more interesting are questions that are not neatly resolved by the end of an episode as well as Lecter himself (Mads Mikkelsen). At the outset of the show he is in private practice in Baltimore, a renowned psychiatrist that Crawford approaches to assist with investigations. Of course we know he will go bad, but we dont know when. Its fascinating to watch him basically act like a good guy, helping the FBI analyze and catch serial killers. He also engages in some interesting conversations with Graham and Crawford, and regularly hosts elegant dinner parties. The show slowly and effectively teases out Lecters evil, dropping hints of his true nature along with showing him partaking in devious behavior (warning a killer that they are about to be caught). In addition, the show does a nice job establishing other mysteries, including whether or not a teenage girl helped her serial killer father and who (if anyone) Lecter has killed himself while partnering with federal agents on the side. While Fishburne and Mikkelsen are very good, Dancy is the star, both literally and in terms of performance quality. He does an outstanding job of subtlety conveying how painful human interaction is for him, and despite being abrasive and unpleasant, you are always in his corner and really feel for the guy. His gift, which is so useful and important, causes him enormous anguish. He also has a wicked sense of humor, generating a few much-needed laughs amid all the darkness. Along with Lecter giving a heads up to a serial killer, there are a number of surprises that spice things up. Among others, a flashback to a Clarice Starling-type agent being groomed by Crawford features a great payoff, and Lecter forms a rather unlikely alliance with someone in the third episode. 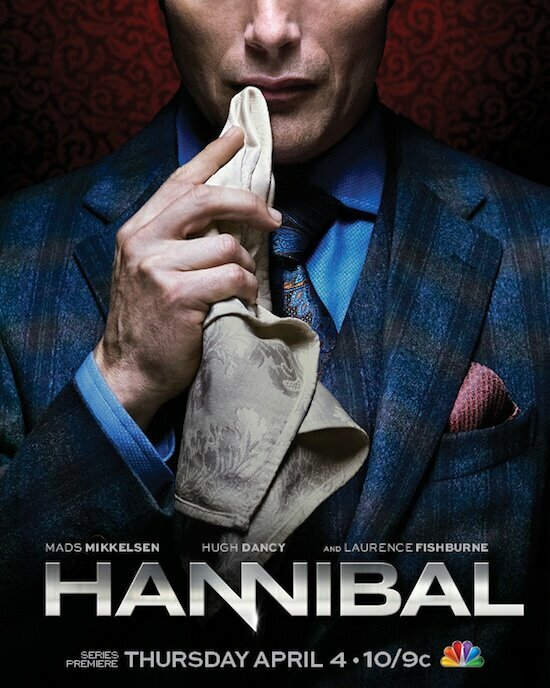 With few exceptions, like the killer-of-the-week tales, Hannibal is an extremely involving and entertaining show. Other exceptions include Freddie Lounds, here a writer for TattleCrime.com, who somehow manages to penetrate crime scenes and gain access to highly secure facilities despite being a notorious tabloid journalist. A sudden detour into Crawfords marriage is mostly dull and takes us away from far more fruitful storylines. Overall, though, the show steers clear of the blandness that plagues network TV crime dramas and successfully balances that which will be familiar to those who have seen the Lecter movies and that which is completely new. I was hooked after the pilot, and after 5 episodes that hasnt changed.